Oscar Cahén (1916–1956) fled Nazi Germany in 1939 and settled in Canada. One of the founders of Painters Eleven, Cahén was in the vanguard of the Canadian abstract art movement while working as a successful commercial illustrator. Cahén supported his painting with the success of his commercial illustrations. He dominated Art Director award shows in Montreal and Toronto for years. “Oscar’s illustrations were so compelling, they inspired an unprecedented reversal of editorial procedure and were sent to authors who were invited to write stories around them,” his biography site notes. A major commission, this September, 1946 cover was done for journalist John Hersey’s harrowing account of the obliteration of Hiroshima the previous year. Cahén’s experiences in eastern Europe with Nazi occupation led often to assignments to illustrate war and its aftermath. But most of his covers reflected Cahén’s humour and his perceptive observation of human behaviour. His ideas ranged from adorable kitsch to poignancy to gentle social commentary. 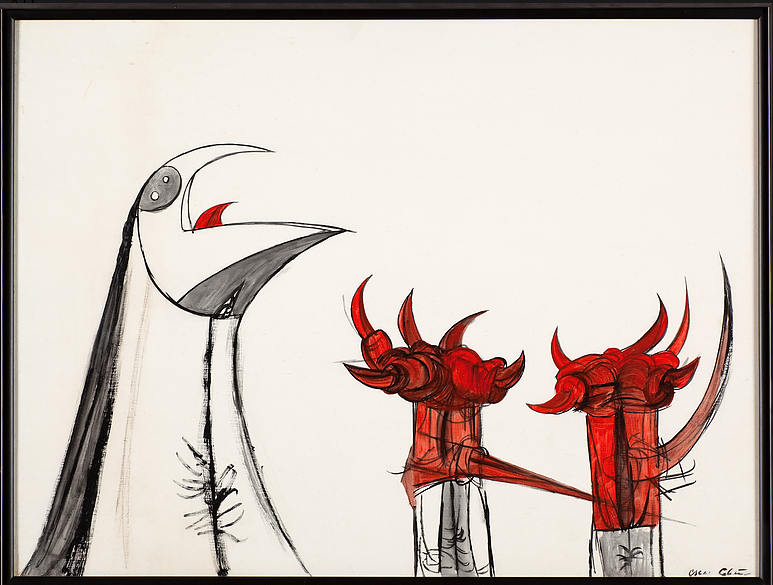 Although Cahén has been described as a “volcano with a paintbrush,” he did not come to public acclaim as an artist until after his death in a car accident at the age of 40. That’s because his talent as an artist was eclipsed by his public prominence as an illustrator. Now, there are numerous sites and exhibitions dedicated to his career, celebrating his powerful influence on Canadian art. Oscar Cahén archive site, here. Collections holding his art, here. Art Institute of Canada, here. This is #15 in the series 150 Artists. His work is fabulous. Considering his times, and that he had fled the Nazis, he remained remarkably open. The distance between horror and beauty is a long, long voyage, and he did it! Yes, true. His magazine covers showed humour and accurate portrayal of normal life in Canada. Impossible if you were bearing weight from earlier in your life.